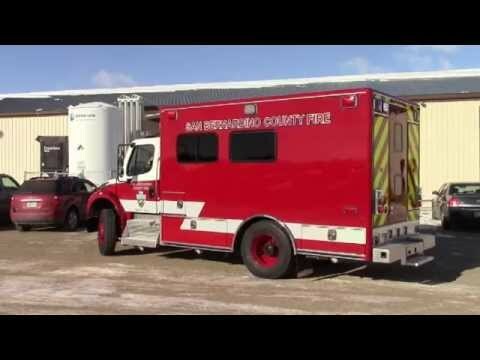 Maintainer Custom Bodies, Inc. is manufacturing custom Crew Carriers for the San Bernardino County Fire Department. A NEW VIDEO (below) highlights one of the trucks that have already been put into service. At 20,160 square miles, San Bernardino County is the largest county in the continental United States. The department is trained to handle hazards prevalent in highly populated urban areas as well as the diverse environmental challenges found in eastern California. MCB's Crew Carriers will help shuttle emergency personnel to the front lines of fires, floods, earthquakes, and other stricken areas. This latest crew carrier has a 15' extruded aluminum body on a 2014 Freightliner M2 chassis. The truck has seating for 13 in the body plus two in the cab. There are also multiple compartments for storage and external slide-out trays for easy access.